← Last Minute Guide to your ICD-10 transition- Make most of the time remaining! One of the highest paying professions in the United States is that of healthcare professionals. However, for medical billing purposes, it is often important to understand the burgeoning fields/medical disciplines which are on the rise and garner the maximum revenue. It has been observed that a specialists’ compensation is higher than that of a primary physicians’ due to innovations in surgeries and novel processes invented frequently. According to Bureau of Labor Statistics, orthopedic surgeons are the highest paid specialty with an average annual salary of $464,500, followed by cardiologists (invasive – $461,364 and non-invasive – $447,143), and gastroenterologists taking the third spot at an average annual salary of $441,421. As per the Medscape Physician Compensation Report, 19,500 physicians in 25 specialties were surveyed upon in the first 3 months of 2015. Specialists topped the list with an annual average earning of $284,000 a year and primary care physicians earning $195,000 a year. The highest average compensation in a year was for orthopedics who earned an average of $421, 00 a year (being more physically demanding), followed by cardiologists ($376,000) and gastroenterologists ($370,000). For non-patient care activities (witness duties, speaking engagements and product sales) as well, orthopedics earned the highest, average being $29,000, followed by urologists, plastic surgeons and dermatologists ($26,000), and neurologists ($24,000). The increase in average salaries from year 2014 to this year was seen in infectious disease physicians (22%), pulmonologists (15%), and pathologists and emergency medicine physicians (12%). According to ‘Modern Healthcare’ Physician Compensation Survey, orthopedic surgeons earn an annual average of $522,659, topping the list in compensation along with cardiologists ($491,126) taking the second slot. As a slightly different indicator, the ‘Medical Group Management Association’ states that orthopedics earn anywhere between $469,000 to $714,000 a year, followed by neurologists who’s average compensation is around $702,000, with cardiologists taking the 3rd place with $681,000 average salary. 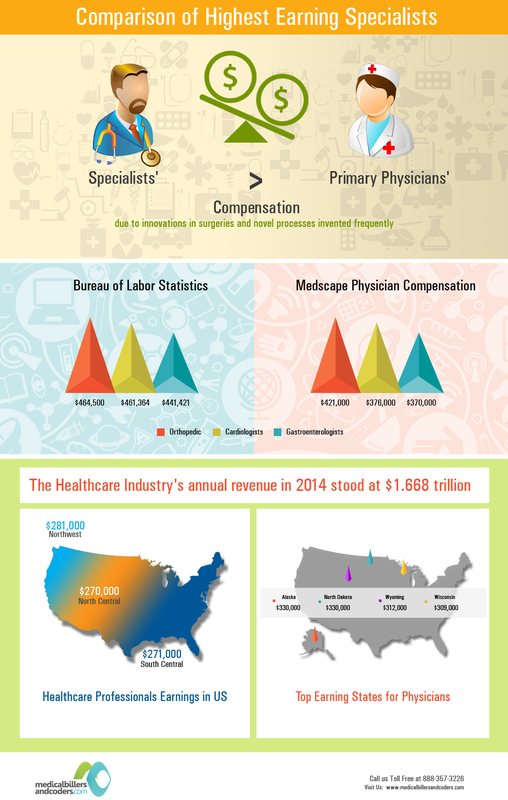 The healthcare industry’s annual revenue in 2014 stood at $1.668 trillion. Apart from hospitals, physicians’ revenues have also increased. The compensation in Northwest US tops the list with healthcare professionals earning an average of $281,000 a year (up from $249,000 in 2013), followed by physicians in South Central US earning $271,000 (up from $249,000) and North Central earning $270,000 (up from $257,000) a year. This is followed by Southeast, Great Lakes and South West. Also, the top earning states (average) for physicians are North Dakota and Alaska ($330,000 a year), followed by Wyoming ($312,000 a year) and Wisconsin ($309,000 a year). A neurosurgeon may make $580,000 in Maryland, but may make $645,000 is South Carolina (Report: Doximity). Similarly, an anesthetist would earn 61% more if he/she moved from Massachusetts to Wisconsin. According to Bureau of labor Statistics, in 2013, surgeons were compensated the best in states like Arizona ($241,710), Maryland and New Jersey. Obstetrics -Gynecologists commanded the best average salaries in Indiana, Mississippi ($237,080) and Oregon ($242,300). Anesthetists earned the highest in District of Columbia and six other states; while dentists earning the most in Wisconsin ($252,390) and Vermont ($215,410) a year. As per the Medscape report, self-employed specialists made an average of $329,000 a year, whereas employed earned around $258,000 a year. So was the case with self-employed primary care physicians who earned $212,000 averaging a year whereas employed earned around $189,000 a year. Also, male specialists (annual average: $284,000) and physicians are paid more than their female counterparts ($215,000). This is mainly due to women either working lesser hours, or working in a different specialty like pediatrics and primary care. Only 9% of women are orthopedic surgeons, 12% are cardiologists and 14% are gastroenterologists. In all, US physicians make a healthy living and are satisfied with their careers. While 64% would again choose medicine as a career, 45% said they would choose the same specialty and24% are in agreement with the same practice setting (Medscape Physician Compensation Report 2015). This entry was posted in Cardiology Billing, Dental Billing, Gastroenterology Billing, Medical Billing, Orthopedic Billing, Practice Management, Specialty. Bookmark the permalink.